Since he'd written and directed the first two Terminators, I asked James Cameron his thoughts on T3. He quickly responded, "I'm not involved in T3." (Click here for that interview). He went on to say, "I'm just not that ... Ahhh, I mean, I told the story." T2 being one of my all-time favorite movies, Cameron's apparent disinterest in T3 certainly lowered my expectations of the film. A Terminator without Cameron (one of the best filmmakers of our time), I anticipated would be like Rocky without Sly Stallone. In this mindset, I sat down in the front row of the fabulous Arclight Theater at Sunset and Vine in Hollywood for the press screening. My only quip, "I don't know if it'll be good, but it'll certainly be big." A few more of Cameron's comments rolled in my head, "I mean, the reason here to make the film is to cash in on the success of the franchise. I think films should be made from an organic place of 'I have a specific story to tell now I'm gonna figure out who's ready to pay for that.'" The cinema darkens and T3 takes command of the screen with brazen confidence, finesse, strength, and humor. While T3 indulges in some contrivances and experiences some internal contradictions, it's charging roller-coaster pace, seat-shaking special effects and dead-on sense of seriousness and humor clearly dominate. I was pleasantly surprised and duly impressed. Jonathan Mostow has taken good care of Cameron's baby, showing both respect and homage to the characters and trends. The film roars out of the gates with absolutely thunderous chase scenes (that crane-truck sequence aptly deserves applause). Though the second half endures a slight decline in action/excitement, it still strongly engages. Not so complex, nor as sprawling as T2 (which I'd give an A+), T3 still tears up the screen and climaxes with a quietly daring conclusion. BTW, T1 - 1984. T2 - 1991. T3 - 2003. Terminator 3: Rise of the Machines. Copyright © 2003. 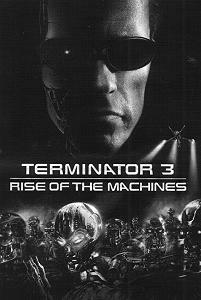 Starring Arnold Schwarzenegger, Kristanna Loken, Nick Stahl, Claire Danes, David Andrews. Produced by Andrew G. Vajna, Mario Kassar, Joel B. Michaels, Colin Wilson at Warner Brothers.